today, friday, is celebrated as "santo viernes" here in nicaragua. actually thursday was "santo jueves" and basically all of managua is closed down since wednesday afternoon in celebration of semana santa. this week, many managuans head to the beaches (tens of thousands flocking the most popular beaches along the pacific coast), and the city pretty much closes down (i think i’m in the only open cafe in town). still, thousands celebrated santo viernes this morning with an 8am procession commemorating the fourteen "stations of the cross" along jesus’ march to the crucifiction. as i’ve said, i’m not a religious scholar, but these popular catholic traditions are incredibly fascinating, and important to me as an anthropologist trying to understand nicaraguan culture. today’s march headed down what is normally a busy avenue - carretera masaya - for several kilometers, ending up at the main cathedral. most people wore white, to symbolize peace; others downed purple robes imitating jesus of nazareth. some people walked backwards, others barefoot, others blindfolded, as ways of paying back "promesas" made to jesus (e.g. for health, cures, or resolutions for other personal, family, or financial problems). many infants and small children were dressed up as angels, complete with white robes and wings; and those well-prepared for the blazing sun brought large sombrillas (umbrellas), hats, sunglasses, and bottles of water. the usual throng of vendors also marched alongside the processants, halking sunglasses, hats, baho vigoron (a light meal of fried pork and nicaraguan salad - cabbage, carrots, and cucumbers), and soft drinks. 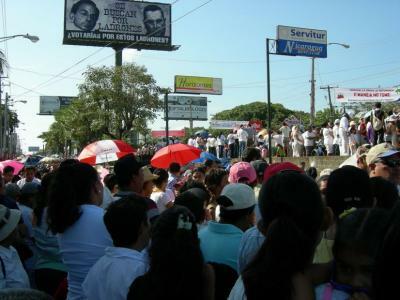 the thousands of managuans filling the carretera and overflowing into side streets came from all social classes, sharing their devotion to this tradition and to their catholic faith. pictured is a view of the march, somewhere out of the frame is a truck carrying an image of christ on the cross, his head adorned with a crown of thorns. every so often, (for a total of 14 stops), the truck would stop, and the archbishop of managua riding along would give a brief biblical lesson. fascinating stuff.